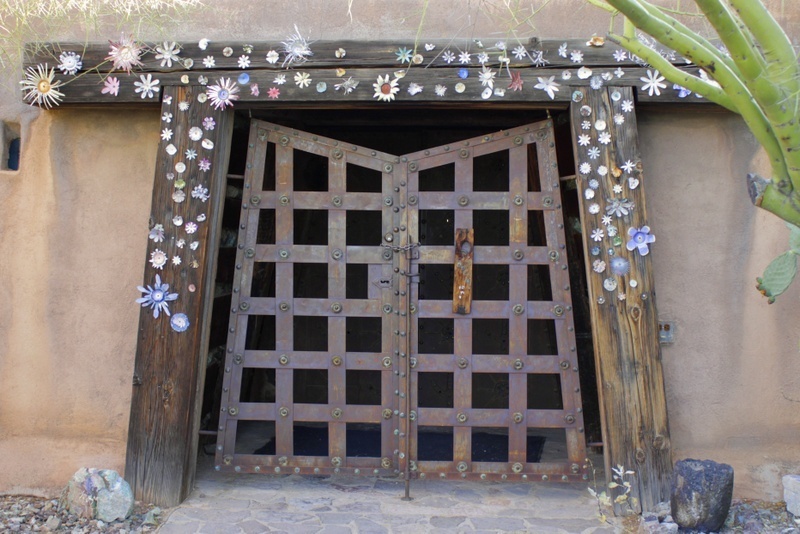 About a year ago, my daughter and I had the great good fortune to visit DeGrazia Gallery in the Sun in Tuscon, AZ. This 10-acre oasis in the desert was designed and built by acclaimed Arizona artist Ettore “Ted” DeGrazia. Filled with nooks and crannies – you could spend days discovering all the wonders of this place! The buildings are winding and organic and filled to the brim with DeGrazia’s beautiful, ethereal and playful paintings. But I have to say I was most enchanted by the colorful metal flowers that dot the property – adorning buildings, doorways and arches and all made from recycled cans. Recently, I’ve been playing with the idea of desert terrarium gardens and landed on the idea of mimicking DeGrazia’s tin flowers as a decorative feature for my tiny gardens. The cuties at the top of this post and those featured below were crafted by my daughter and I; they measure less than an inch across and stand about 1.5-2″ tall. 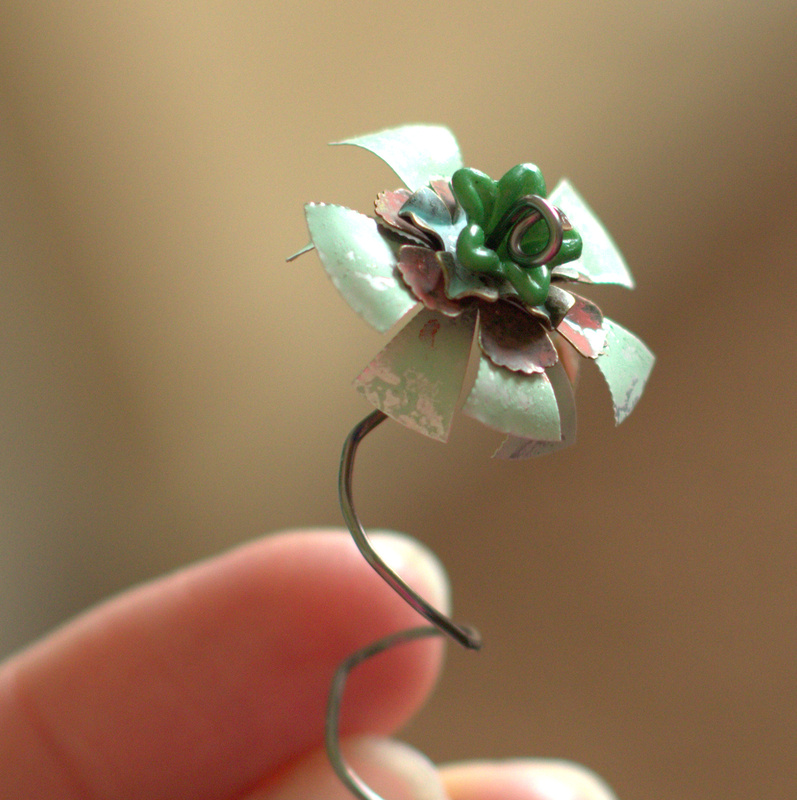 Each tiny flower started with a piece of medium gauge wire, we made a tight little curl at the flower-end to hold everything in place, then layered on beads and prepared aluminum pieces. We found that my regular craft scissors and craft punches cut the aluminum beautifully (and, so far, everything still seems to be working fine with paper, though can’t say for sure how that will be over the long term). In the example above, I used an Adirondak acrylic paint dabber (in Juniper) to color the back of my tin piece and made the back my feature – I also added a couple of the Tim Holtz Foliage pieces – painted with Red Pepper and Aqua paint dabbers. To hold everything in place, we used metal eyelets that we just crimped with pliers (crimp beads would likely work better – just didn’t have any on hand). Once we had everything together, we used the end of a paintbrush to curl and shape the flower petals. In this example, you can see that the printed side of the aluminum can is featured – I’m on the hunt now for colorful cans!! I’ll keep you posted as this project progresses – I’m thinking little houses, twig chairs, acorn cap birds nests, tiny bottled collections, and more. Stay tuned! Tuscon holds a piece of my heart – I go at least once a year and love it more every time!